That’s GREAT. 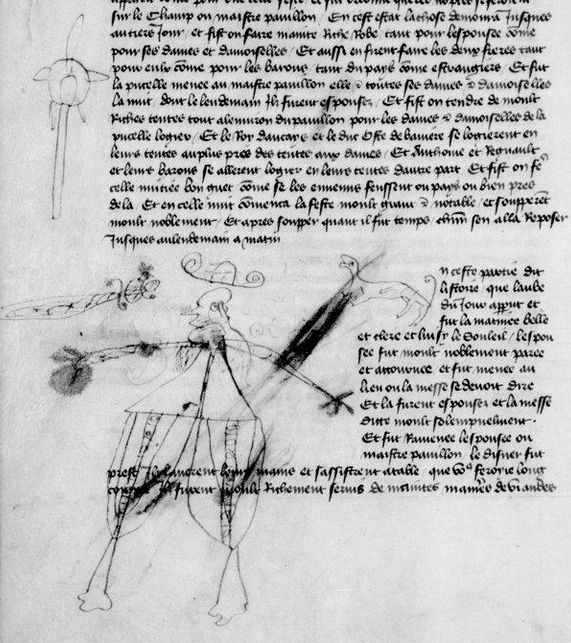 I’m pretty sure this drawing’s escaped (for now) the attention of Erik Kwakkel, that indefatigable emissary for medieval manuscripts, though he has blogged on doodles, and even children’s doodles. Please let me know if you’ve seen this before, and where. Google searches for child drawing Melusine or l’enfant dessin Melusine get me nothing useful. For now, we’ll just observe that this drawing, dating from, I guess, the late 16th or early 17th century, is all too appropriate in a story so concerned with lineage. And, uh, dinosaurs and maces. This entry was posted in MedievalBlog and tagged art, children, manuscripts by medievalkarl. Bookmark the permalink.